Maybe I had an extremely sheltered childhood, but there are a lot of foods I never heard of before I started cooking for myself. My parents weren’t very adventurous eaters, so if it wasn’t Italian, Americanized Chinese food or a cheeseburger, then I had no idea that it existed. Thanks to the internet and my extensive (and absurd) cookbook collection, I’ve slowly but surely been making up for lost time ever since! Taquitos are one of those foods that I had never seen, heard of, or tasted before venturing into the world of food blogging. Looking back, I find that crazy because they are not even that “out there” as far as food goes! Literally meaning “small taco”, taquitos are actually an American creation, originating in New Mexico. Typically, they consist of a rolled up tortilla that is stuffed with meat and cheese, deep fried, and served as an appetizer with some kind of dipping sauce. 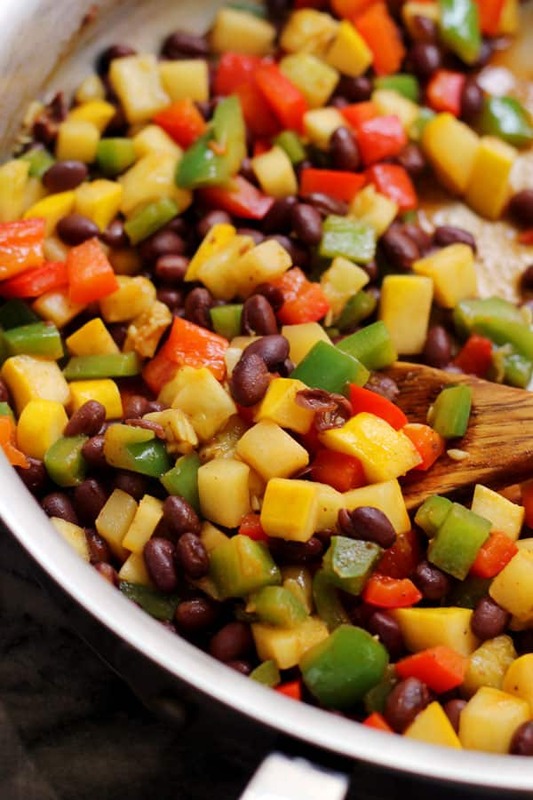 Given that I hate messing with hot oil and I don’t eat meat, I gave these a healthier and meat-free twist by baking them and stuffing them with summer veggies and black beans. Oh, and cheese. (That’s just non-negotiable for me.) Basically, bell peppers and summer squash are sauteed with cumin and smoked paprika for umami, and a touch of hot sauce for spice. The still-warm mixture is tossed with black beans and pepper jack cheese, stuffed into taco-sized tortillas, and then baked until nice and crispy. They can be made with flour or corn tortillas, though I favor flour because they are easier to work with. I found that the corn tortillas were more prone to breaking no matter how much I heated them before trying to roll them. Then, serve these with whatever dipping sauce is your favorite! I went with a jar of salsa verde because that’s what I had in my fridge, but pico de gallo, red salsa or guacamole would also be delicious. Put away the oil, because these taquitos just need a few minutes in the oven to get crispy and delicious. Gooey pepper jack cheese, cumin-spiced black beans and veggies make them a go-to weeknight meal. Heat the olive oil in a large skillet over medium heat. Add the bell peppers and squash to the pan. Saute for 5-6 minutes, or until just tender, stirring occasionally. Add the cumin, smoked paprika, hot sauce and black beans to the pan. Season to taste with salt. Saute for 2-3 minutes or until heated through, stirring constantly. Remove from the heat and toss with the cheese. 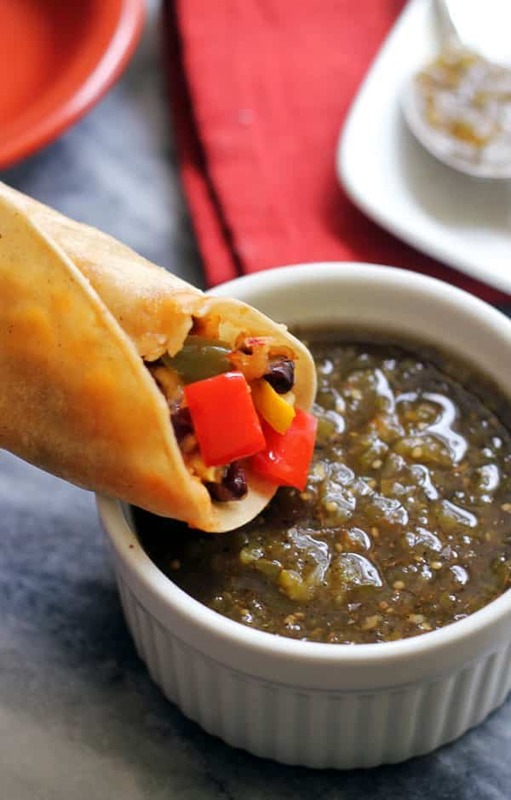 Place 2-3 tablespoons of the bean and veggie mixture down the center of each tortilla and roll up. If needed, microwave the tortillas for about 30 seconds to make them soft and pliable enough to roll. Place on a baking sheet. Spray the taquitos with cooking spray, then sprinkle with coarse salt. Zucchini or summer squash can be substituted for the pattypan squash. Feel free to add more or less hot sauce, to taste. This sounds DELICIOUS!! As a vegetarian, I’m always on the hunt for relatively quick and easy recipes to make. Also, if it involved pepper jack cheese, I’m definitely game! I love always coming back to Oh My Veggies as a resource! Thanks so much Neha! I’m with you on anything cheesy – love it! As fellow vegetarians we are thrilled to be getting such easy and delish green recipes! Thank you for this fun take on a Mexican favorite! Thanks! Mexican food gets a bad rep but it really can be good for you if you stuff it with enough veggies. This recipe looks greta – simple and delicious! Please could you tell me what the tasty looking sauce is in the photo? Thanks! It’s salsa verde! Not homemade, just from a jar. You should add the Salsa Verde to the ingredient list. This needed the sauce. If it is listed as an ingredient, then will it appear on the shopping list? That would help out. Thanks! Love it. Great dinner that’s a little different from just tacos. Thanks for the feedback! I agree it’s a great change from your typical taco dinner.